This month I’ve been on a no-bake treats kick! I love how easy these little sweets are to whip up and you can pretty much add any ingredient you like! 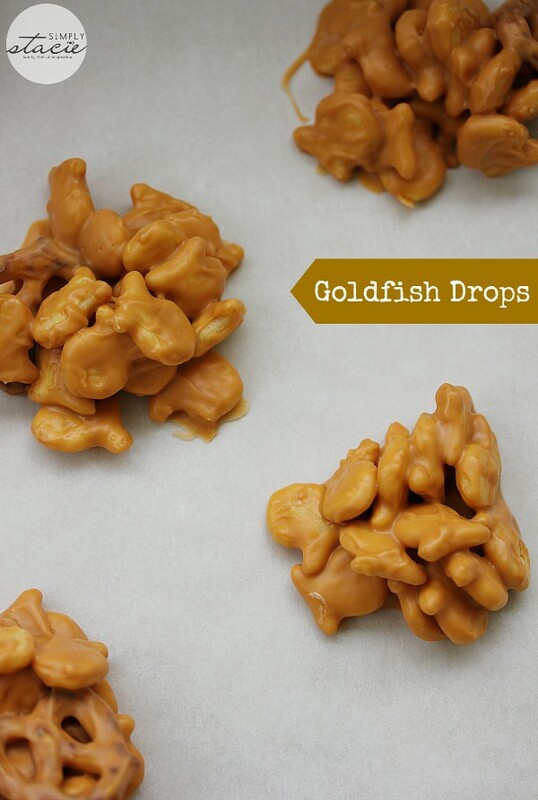 I remember seeing this Betty Crocker recipe for Goldfish Drops a few years ago. My kids ate Goldfish crackers like they were going out of style when they were little. These tasty confections are similar to my recipe for No-Bake Chocolate Peanut Butter Haystacks. It’s basically melting your base and adding in the various ingredients. 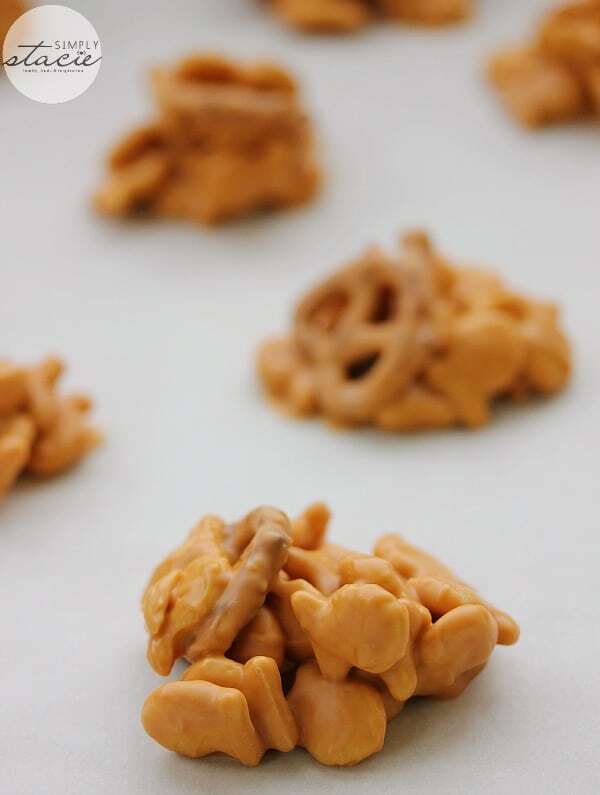 This recipe for Goldfish Drops has butterscotch chips, original Goldfish crackers and pretzels. I’ve also made them with white chocolate chips, peanuts and vanilla Goldfish crackers. They are sweet and a just a little bit salty thanks to the addition of the pretzels. And lots of crunch! The last batch I made did not last very long! Just four ingredient in this no-bake treat that kids love! In a saucepan, melt the butterscotch and shortening over low heat, stirring often. Remove from heat. Stir in pretzels and Goldfish crackers. Drop by tablespoons onto wax paper. Leave to set at least an hour. Serve once butterscotch is firm. Makes about 18 to 20 drops. I would have never thought to use goldfish in treat like this. Thanks for the idea, I’m sure my kids will love this..
Well these are different! They would be devoured in this house! Oh my goodness…pinning this recipe right away….I know some kids who would LOVE these! wow what a neat idea & tasty treat! I’m for sure making this! Thanks so much for sharing. I can’t wait to try these. We all love sweet and salty! Thank you! 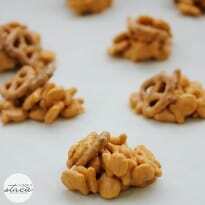 I have made similar ones with cereal but had not thought of using Goldfish, I will have to try that out!! OMG I need to try these! Wow, I have to make this treat soon and not just for the kids…I love Goldfish and to have them covered in butterscotch…Yum! This looks delicious, very creative, I think I would go a step further and cover it in dark chocolate. Thank you for sharing this recipe. I like the idea of peanut butter and pretzels added. It would be a nice snack to have around. My kids love Goldfish crackers and pretzels. They would be thrilled with this snack! THese look good and I imagine that they are not super sweet because of the goldfish and the pretzels in the, I think that my granddaughters and I would like to try these, I have printed out the recipe, Thank you for sharing this recipe. Thanks for sharing. Have always just used them as is. I love sweet and salty from the new Chips Ahoy cookies to caramel and cheddar popcorn and potato chips with chocolate frosting. I would have never thought of this though. Love the idea, ease, and versatility. My grocery store has store brand puffins that are puffin shaped crackers. My grand kids live in Florida and think they are really cute. They would love puffin drops. Great snack idea for the kiddos!!! You always come up with some great recipes! Thanks! wow! I’ve never seen anything like this before!! I’ve definitely got to try this for one of my son’s classes!! How cool!!! My Grandkids are going to love these! oy! These wouldnt last long in this house! wow, these look awesome, going to try them !! I like this for kids. Thanks for the idea, the kids will love this for sure ! Awesome. I want to make this tomorrow for my nieces. They came to visit for a week. They would love this. very cute my grandkids would go crazy for these! Looks delicious and such an easy recipe to make too. Thanks for sharing. These look delish, and I have a sneaky feeling that the adults will enjoy these just as much as the kids! Found you on Too Cute Tuesday! holy cow!!! These look so dangerous! 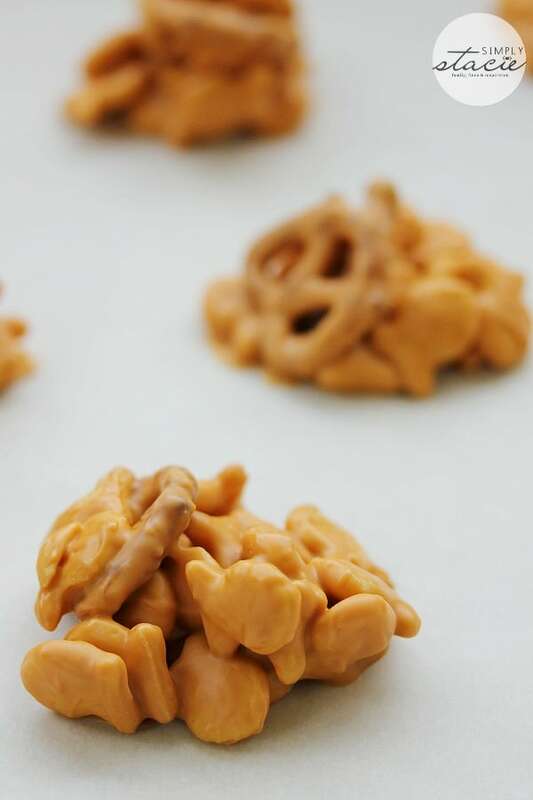 i love goldfish crackers, they’re a guilty pleasure and I seriously can’t wait to make these…for my kids…mmmm! yum, i love goldfish, and welcome any new way to eat them. Ummm..yum! I don’t have kids but I would totally make these for myself. 🙂 Thanks for the recipe!! What a fun idea! This would be so adorable to have for kids! I’m sure kids just love this! Thanks for sharing! I’d say that I would make these for the kids lunchboxes but I would end up eating most of them! lol Looks so good!!!! My mom used to make haystacks when I was a child. Haven’t thought about them in years! My son still loves goldfish–will have to make these for him.